This powerful Husqvarna 450E gas-powered saw for people who value professional qualities in a saw. The X-Torq engine means lower fuel consumption and reduced emission levels. Auto return stop switch and visible fuel level makes the Husqvarna 450E easier to handle. Equipped with Smart Start and fuel pump to every time ensure easy starts. This Husqvarna 450E features a felling marks for better felling precision, snap-lock cylinder cover to save time when changing spark plug and cleaning and an ergonomic rear handle for increased comfort. Abe Lincoln once said, "Give me 6 hours to chop down a tree and I will spend the first 4 sharpening the axe." He wouldn't have needed any time if he would have been wielding the Husqvarna 450E Gas Chainsaw. This is an powerful all-round saw for people who value professional qualities in their equipment. The X-Torq engine means lower fuel consumption and reduced emission levels. The auto return stop switch and visible fuel level makes the saw easier to handle. It's equipped with Smart Start and a fuel pump to ensure an easy start every time. The centrifugal air cleaning system removes larger dust and debris particles before reaching the air filter. This results in reduced air filter cleanings and improved engine life. The quick-release air filter facilitates cleaning and replacement of the air filter. 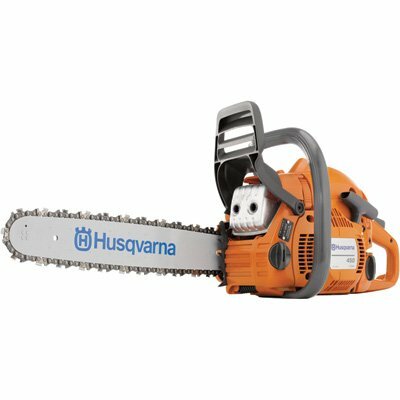 Make quick work of downed trees or pesky limbs with the Husqvarna 450E Gas Chainsaw. Store: cellsnothertech4u Condition: Brand New Price: $309.95 Total Price: $309.95 Buy It from cellsnothertech4u No returns. Store: woodland_liquidators Condition: New (Open Box, or other) Price: $349.99 Total Price: $349.99 Buy It from woodland_liquidators No returns.